I have to give plenty of credit today to Senator Gary Humphries (Liberal-ACT) for bringing up the topic of the ongoing problem of voter fraud. That is, people voting more than once through various means. The last Federal election saw over 500 cases in the ACT where a person may have voted more than once, according to official Australian Electoral Commission data. 1458 people across Australia actually admitted to multiple voting. Of those, 19 cases were referred to the AFP for further investigation, but at the conclusion of the investigation just 3 people were issued with a formal police caution. The figures have been obtained by Senate Opposition Leader Senator Eric Abetz, a former Special Minister of State. The 506 potential multiple votes from the ACT add to the national total of 29,920. “By the AEC’s own admission, a simple denial of multiple voting leads to no further follow up by the authorities. “It is imperative that Australia’s voting system is robust and its integrity is upheld. If the net result of 29,920 cases of multiple voting is no prosecutions at all, where is the disincentive? “We may need to consider better methods of ensuring voter identification at election time. “It’s also clear that there needs to be a much greater emphasis on pursuing alleged offenders if we are to maintain confidence in our electoral system,” Senator Humphries concluded. It’s just a shame that this is being brought up now, at a time of year when very few people will notice, because it is a real problem and it is probably changing the outcome of elections…and when you consider just how close the last election was, it’s a very real worry. By the AEC’s own admission, a simple denial of multiple voting leads to no further follow up by the authorities. In other words, if you deny that you voted more than once, the prosecution will not be pursued, mainly because there is no real proof that it was actually you who turned up to all of those polling places. Personally I am in favour of requiring voters to produce photo ID at polling places, although this still doesn’t entirely solve the problem as it does not stop fraudulent identity documents from being used and therefore does not provide enough evidence to prove that anybody has actually committed electoral fraud. Therefore I also support the idea of requiring that people have their photo taken when they have their ID checked…while this doesn’t stop the multiple votes at the time, it does provide actual proof for a prosecution, which in turn provides a real disincentive to cast multiple votes. I elaborated on my thoughts and reasoning in a lengthy comment over at The RiotACT which is copied in below for your convenience. It’s not just party hacks who vote multiple times; people who want more of a say in the process for one reason or another do it too, whether they be non-party affiliated ideologues (I count myself in this category, although I have not voted more than once in any election), angered with the status quo to the point where they think they have to take action, simply pompous enough to think that their view is more important, or some other reason, or perhaps a combination of the above. At the last ACT election, a friend nearly gave me their vote because they weren’t interested enough to vote. It was tempting, but in the end I came to the conclusion that it was better for them to simply not cast a vote (by turning up and casting an invalid vote) than to give somebody more of a say than they deserve. The interesting thing about this though is that if it had worked the other way (ie. they couldn’t be bothered voting and asked for a copy of my vote so that they could submit an identical vote) there would be no way to track it as, for all intents and purposes, we would have both voted individually. In the last federal election I considered studying the electoral roll and presenting to polling places as various people from the electoral roll…never twice to the same polling place and never twice as the same person. This way it would be difficult to prove that I, or any of the people I presented as, would have actually voted twice. Further, to assist in avoiding attending polling places as somebody who has already voted, I would map out where the people that I intended to impersonate live and avoid impersonating somebody at their nearest couple of polling places. The biggest danger from this plan would come from, ironically, party operatives (ie. the pamphlet pushers and their supervisors) who circulate between polling places throughout the day and might recognise me in multiple places. It would also have been imperative to avoid any location which, at the time, contained a candidate, as appearing in the background of footage of candidates in multiple locations could pose a problem. Again, I did not go through with this, partially because it would have been the wrong thing to do, and partially because I had to work on election day and would not have had the time or energy to make it worthwhile, especially seeing as the only way to make this worthwhile is to ignore safe seats and visit marginal electorates…and our nearest marginal electorate does not have the density of population or polling places to aide in the efficiency of such an operation. I do believe that something should be done to try and stop electoral fraud, but branding people with ink is not the answer. Any ink can be removed with enough effort. At best such a plan would just slow down those who are keen to vote more than once. It certainly does not prevent somebody malicious from fronting to a polling booth as somebody else in order to prevent that person from voting, even if they then do not remove the ink and simply pay the fine for not voting themselves. I do believe that requiring photo ID at polling places is the way to go. I do not believe that people with less identifying documents are more likely to vote for Labor or the Greens, nor do I believe that said people lack the resources to obtain valid identifying documents. My mum, for example, does not have photo ID and, quite reminiscent of a scene from ‘Mother & Son’ doesn’t quite understand what it is, thinking that an old photo of herself counts. This is something which can be overcome through an advertising campaign, and perhaps some assistance from a close family member or friend (I could take Mum to a government shopfront at any time and help her get a Proof Of Age card if she ever wanted one, for example). The benefit of photo ID is that it proves that you are who you say you are and that you are not somebody else (something which ink can not do). There is still the small problem of identity theft and forged documents, although it is much harder to produce such documents these days due to the protection mechanisms in modern identity documents. At the same time, I do not believe that a live electronic database tracking who has and has not voted, and checking people against that list when they present to vote, is a viable option either as it is too open to abuse, be it by somebody running around with fake ID or by a rogue electoral worker or by a hacker. A potential solution would be to take a photograph of a person when they show up to vote and have presented their ID. Then, later on, any recorded instances of a person voting more than once could be checked against the photographs taken at the polling places and prosecution could be based on this evidence…the penalties might need to be a bit tougher than they currently are though, otherwise it might not be worthwhile chasing people. Multiple voting is a problem which can be minimised, but not entirely eliminated in my view. Active checks of ID on the day, while gathering enough evidence (photos) for follow-up if necessary is in my view the simplest, safest and most-effective way to minimise the problem while still erring on the side of caution so as to not accidentally prevent somebody from exercising their right to vote. For as long as I can remember, Carols By Candlelight has been an institution in my household, being absolutely compulsory viewing every Christmas Eve. For me, it has marked the turning point at which the busy-busy build-up to Christmas ends and the relaxation of the arrival of this most joyous of days arrives. I’ll admit that, since Ray Martin decided to vacate his position as host of the show, the show has felt less and less special to me each year. It seems as if the show has become less traditional since Ray left, and the tradition of it is what really made it special…it’s what made me (and everyone in the house for that matter) eagerly watch the show or listen to bits of it on the radio if I still had presents to wrap. This year that slow decline finally hit the point where I could no longer bear to watch. It started with Lisa reading “Dennis Walker” off the prompter without even thinking that it might actually be Dennis Walter, and then discussing with Karl the fact that this “Dennis Walker” is not related to Stan Walker…a clear and sure sign that not only was most of Karl and Lisa’s banter coming straight off the prompter, but they also had no idea what they were talking about or who was going to be on the show. Then “Uncle Doug”, the eccentric head of the choir, was asked to lead the choir in their usual performance of “Ding Dong Merrily On High”. When Doug sings this song, he becomes quite animated, and it is tradition to see Doug get stuck right in to this song…but no, we got stuck with wide shots of the choir. Doug was in there somewhere, but was practically invisible. One of the highlights of the night each year was gone. Then, the clincher. Every year for as long as I can remember, and probably longer, Humphrey B. Bear has been involved in the kid’s segment in which Santa comes to visit. In recent years Hi-5 became the main attraction here, and I could accept that given their popularity and prominence within the Nine Network, but Humphrey still had a key role, most recently as Santa’s helper. I was worried when I did not see Humphrey listed in the opening credits, but sat and waited patiently anyway. Hi-5 came on, and at this point everything was normal as Hi-5 always come on first and sing their usual array of songs…but then it got weird as a cross-promotion for a movie came on stage to help Hi-5 find Santa…The Happy Feet Penguins. When I say “The Happy Feet Penguins” I really mean a bunch of creatures which only bore a passing resemblance to the aforementioned penguins. Santa then appeared, did his thing and left to carry on with his busy schedule. No Humphrey. At this point I turned the television off in disgust. Humphrey is an extremely important part of the tradition of of Carols By Candlelight; he makes me extremely happy and mellows me to the point where I am nice and comfortable and ready to enjoy the rest of the night’s entertainment. The lack of Humphrey made me angry, and with the rest of the show having not impressed me up until that point, I could not carry on watching it. Others in my household expressed similar thoughts and feelings. Humphrey was at the Bowl making appearances on the night and the Dress Rehearsal, but relegated to commercial breaks. Humphrey finally came out during the curtain call, a fleeting glimpse of a bear without pants somewhere amongst the crowd…. Well I’m sorry, but I’m livid. Humphrey is an icon, a National treasure and an institution. Humphrey deserves better than to be relegated to warming up the audience. Excluding him from the television show is a disgrace. I can understand the incentive for having the penguins which didn’t look like the product they were promoting as a part of the show, but there was no reason to exclude Humphrey. Humphrey could still have made an appearance with Santa as Santa’s assistant…it didn’t have to be a big role, but he owns the Santa segment and, with all due respect to Santa (who also seemed to shunted aside to an extent to make room for the show-sponsoring almost-penguins), the segment does not work without him. All I can say is that a Christmas tradition was ruined for me last night, and if Humphrey’s name is absent from the opening titles again next year, I shall not be watching. To treat Humphrey in such a way is shabby at best, and I won’t allow my Christmas eve to be tarnished in such a way again. If that means that I miss out on Carols By Candlelight, then so be it…they’re not the only source of carolling, and I will get my fix elsewhere. Hear hear! And if Nine can’t sort it out, then I hope that someone else picks up the rights to Humphrey and will treat him with the dignity he deserves. Icons who have entertained and educated generations upon generations of Australians deserve so much better than what Nine did to poor old Humphrey last night. Hopefully it is fixed for next year, and hopefully Humphrey is compensated with an enormous amount of honey…it’s the least he deserves, and about the only way that Nine will get me to watch Carols next year. Kim Jong Il back from the dead? 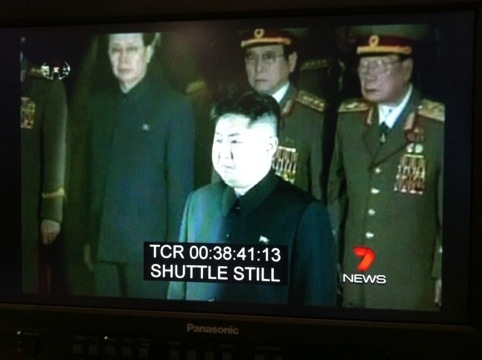 Is it just me, or does it look like Kim Jong Il has come back from the dead to watch his own funeral? And I’ll let your imagination work out what RIH might stand for. North Korea’s menace of a ruler, Kim Jong Il, is dead. Good riddance to bad rubbish. Unfortunately his insane son Kim Jon Un will take over as leader, although one does have to wonder if the fact that Un is even more crazy than Il could result in a destabilisation of the family’s leadership in the future, and hopefully the end of an awful regime…although when I say “hopefully”, I do still worry about the fallout from such an end to that regime. For what it’s worth, as this screenshot will attest (blurring added to protect the identity of those who “liked” my status update) I had this news up on Facebook at 2:21pm, mere moments after I received a mobile alert about the news from Matt Drudge’s excellent DrudgeReport.com, and before most (not all) of the Australian media had caught up…alerts from Drudge are very rare, so you know that something very big and very serious has happened when an alert comes through. On this occasion it was good news. North Korean TV says he died from “Physical and mental over-work”. Ahhh those communists, always claiming that work is bad for you. His psychopath son, Kim Jong Un, will now take over. We’ll know soon if the world will stay the same, be better, or if we’ll see WWIII break out. I’m tipping that it will stay the same for the moment, but when enough people in North Korea cotton on to just how nuts Kim Jong Un is, we will see a fracture in the country which will result in in-fighting, followed by some people defecting to the South to escape while the rest of the nutters keep fighting against themselves and eventually fire at the defectors, which will reignite the Korean war…whether that leads to a global conflict, I don’t know, but I think the markets are on the money with their fall in reaction to the news of Kim Jong Il’s death. Casey has more information about this on his blog at http://caseyhendrickson.wordpress.com/ including information on why he thinks North Koreans will not rise up against their government (video not available in Australia…I’ll try and find a version which is later) for the most part I think he is right, but I also think a small number of people deciding that they’ve had enough will be enough to start a conflict there. It’s well worth a read. But until a conflict breaks out, there is some time to celebrate the death of an evil man…and that is precisely what I intend to do. Update: In the spirit of happiness, this made me burst out laughing, a website which is dedicated to photos of Kim Jong Il looking at things http://kimjongillookingatthings.tumblr.com/. Again, h/t Casey Hendrickson for the link. I’m sure that I have given the award to Judith Durham before, but I saw her singing last night at Carols In The Domain and was moved by her performance, so this week’s award goes to the lovely Ms. Judith Durham and we have two songs from her from last night’s performance: “Hark The Herald Angels Sing” and a slightly modified version of “Morningtown Ride”. I’m at work at the moment, so I can’t call, but I’m enjoying listening anyway. I just heard your comments about McDonald’s and I have to agree. Apart from having a decent product, the stores are all locally owned and provide employment for a huge number of people across the country, and not all of them are kids either. It’s a success story of the free market, providing services that people want, need and desire, and thriving as a result. McDonald’s gets blasted for being unhealthy, and you might remember the so-called documentary a few years back “super size me”. Well multiple independent studies have followed the methods employed by that film to discredit McDonald’s and, to their surprise, the participants not only lost weight, but were deemed to be healthier by their doctors. I don’t endorse living entirely off McDonald’s food, but in moderation it’s fine. A friend of mine, Casey Hendrickson, who hosts a breakfast radio program in Indiana, put together a video about the studies in to McDonald’s called “Using Their McSmarts”. It’s on YouTube at http://www.youtube.com/watch?v=hj6imJNQXBY if you’re interested. Changing subject, when you speak to Derek Dryden next, could you please say thanks to him from me. I ordered a book through his website a couple weeks ago. The book is out if print and was probably never sold in Australia. One if his staff, Kate, was able to track down the publisher and order a reprint for me. It should arrive in a few weeks. Fantastic service. Derek and his staff deserve a big thanks. Also if you are wondering, the book which I ordered from Derek Dryden’s Better Read Than Dead is radio host Mark Levin‘s “Men In Black” which is about judges overstepping their authority. Amazon has used copies for sale, but Derek’s people were able to order a reprint which is preferable in my view. The book is topical today given that a judge in New South Wales is pushing for the abandonment of jury trials…again. The day we let the elites strip us of our right to a jury of our peers is the day that we can say goodbye to a civil society. A month or so back the rumours of impending cutbacks at Melbourne’s newest talkback radio station MTR1377 started to come true when overnight news bulletins started to be relayed from 2GB in Sydney rather than being locally produced. Local night programming was also dropped in favour of a straight relay from 2GB with local commercials. It all seemed to be happening slowly, and with Program Director and Breakfast host Steve Price adamant that rumours of the station’s local programs’ impending demise were false, it was hard to escape the conclusion that Steve Price had some hand in preventing Macquarie Radio executives from wielding the axe. A close source has revealed that Steve Vizard will be finishing up at MTR 1377 on Friday. The only live shows from Melbourne on MTR will be breakfast and drive, everything else will come out of Sydney. Most of the newsroom staff who were made redundant have already moved on to new jobs. Melissa Polimeni, Allison Wallace and Matt Thompson have been hired by SEN, who will now provide their own news service. Ashleigh Brown had already quit and is starting at 3AW in January. No word on the future moves of Christie Kerr or Ben Radisich. It should be noted that Christie Kerr was still on the air on MTR this morning, although the sound quality was different to yesterday, almost as if she was working in a different studio or pre-recording her appearances. It is interesting that SEN, the Pacific Star owned and operated station, has hired some of the journalists from MTR, the Pacific Star & Macquarie Radio joint venture station. MTR is likely to get the long-promised upgrade to its transmitter that Macquarie have long-claimed will make the station more profitable (or perhaps “less unprofitable” would be the right terminology) and so I have to wonder if MTR will at some stage run a small local news bulletin before or after 2GB’s news, utilising the resources of the SEN newsroom? At the moment there is no word about the future of MTR’s weekend afternoon program with Glenn Ridge. I would be a tad surprised if it gets axed as 2GB’s weekend afternoon programming, not so much in summer but especially in winter, is very NRL-centric and MTR currently provides an alternative to the AFL on almost every other talk station in Melbourne. It might be an idea for MTR to carry NRL matches from 2GB as SEN is busy with AFL at that time, but the hours of NRL discussion would be too much for Melbourne. What I do hope is that with the cost cutting now, once the transmitter upgrades have been completed, Macquarie and Pacific Star are willing to give MTR another shot with Melbourne-based programming, during the day at least. Taking Ray Hadley’s morning show would be preferable to taking Chris Smith’s afternoon show as Hadley’s show is the stronger news-based program in my view and would provide a decent alternative to Neil Mitchell on 3AW, plus Hadley’s show ends at 11am on network stations and MTR could easily run a locally-based show from 11am (or 12 if they decided to carry Alan Jones Highlights at 11). The afternoon is probably a better time for a local show than the morning, especially if you’re trying to carve out a point of difference to 3AW who have a very strong local morning show and a not-so-strong and not-particularly-newsy afternoon program. It is sad to see MTR go through this, and I do have to wonder what Steve Price thinks about these changes being made while he is away, but I do hope that at the end of the process, MTR can return with a refined product which might be more competitive in the Melbourne market. They won’t beat 3AW any time soon, but they might at least be able to gain a few ratings points and reach a point where they are commercially viable. As part of the changeover to digital television, the southern Canberra suburbs of Conder and Banks will have analogue television switched off today. These two suburbs are, for the most part, unable to receive television transmissions from Tuggeranong Hill clearly and instead utilise a small relay transmitter at the back of Banks. The transmitter, which is located within the compound of the water tank on the hill behind Orange Thorn Crescent, receives transmissions from Tuggeranong Hill and then retransmits them across the area which is in the shadow of Tuggeranong Hill. The transmitter site is not large enough to accommodate analogue and digital transmission equipment at the same time, so the analogue equipment has to be removed before the digital equipment can be installed. According to workmen who were on-site yesterday, this should take about a week. Some residents in Conder and Banks are able to receive transmissions from Tuggeranong Hill, especially those which are closer to the relay station than to Tuggeranong Hill, as they are in an elevated position which is not in the shadow of the transmitter site. Others in the valley put their antennas on large polls to receive signals from Tuggeranong Hill. It is interesting looking at some parts of Banks and Conder and seeing almost every house have an antenna which is pointing in a different direction to the antenna of their neighbour, especially in areas where reception from the Banks Water Tank would be clearer but people have gone to the extra effort to try and receive digital signals from Tuggeranong Hill. The people who use the Banks transmitter may very well decide to try and get a signal off Tuggeranong Hill when they turn on their TV this evening and find that they are no longer receiving a signal. By the middle of next week, when the upgrades at the Banks transmitter site are completed, digital television reception in Conder and Banks should be greatly improved. The rest of Canberra is due to have analogue television switched off on the 5th of June next year and will not have to do without television when that happens, as the rest of Canberra’s transmitter sites are large enough to accomodate analogue and digital transmission equipment at the same time, and have been running the services in parallel for a number of years.